“Spine.” Tansy DAVIES: Var. comps. Var. performers. NMC Records NMC D176 (1 CD) (http://www.nmcrec.co.uk/). Highlights of Davies’ nine-piece collection include Isis in which a leading saxophone gesticulates enthusiastically albeit fruitlessly over a 15-person chamber orchestra. Davies hides antique gestures in the strings as everyone else strikes contemporary poses. Two tenor-and-piano songs interleave the chamber pieces. Fortunately, the songs passed quickly and avoided chordal accompaniments. Falling Angel (17-piece chamber ensemble) reveals a knack for superimposing distinctive material progressing at different rates (as in Carter). A viol consort, make black white, quite literally rearranges Dowland’s “Flow my Teares.” The piano series Loopholes and Lynchpins visit similar cutting board techniques upon Scarlatti sonatas. The title piece requires 11 musicians. Richard AYRES: No. 37b for orchestra (2003-06)1; No. 36: NONcerto for Horn (2002)2; No. 31: NONcerto for Trumpet (1997-98)3. Frankfurt Radio Symphony Orchestra1, Wim Timmermans2 (hrn), ASKO Ensemble2, Marco Blaauw3 (tpt), musikFabrik3, Roland Kluttig1,2,3 (cond.). NMC Records NMC D162 (1 CD) (http://www.nmcrec.co.uk/). A onetime Feldman disciple now labors at the opposite spectrum. 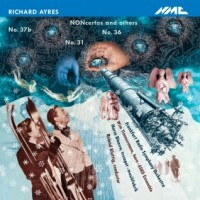 Ayres’ maximal, sometimes gleefully capricious music takes a slapstick slip across banana peels. His catalog offers numbered works from intimate to grand. The orchestral No. 37b favors bright and low colors, combining Revueltas’ rambunctions with Adams’ patter. Carl Stalling could safely have left his cartoon scoring job to Ayres. The horn “NONcerto,” a concerto with negligent soloist, suggests Strauss’ Alpine landscape turning up at a Californian flea market. During the second movement the hornist hides behind a closed door when not playing. The third movement portrays 11 stages in a journey that ends peacefully in death. No. 31 for trumpet and orchestra includes an Elegy for Schnittke, a most appropriate ancestor. Of course it closes comically as well as bittersweetly. 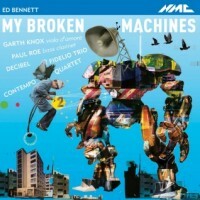 “My Broken Machines.” Ed BENNETT: Stop-Motion Music (2010)1; Slow Down (2010)2; Cartoon Music (2007)3; Monster (2005)4; for JF (2007)5; My Broken Machines (2004)6; Ghosts (2008)7. Paul Roe4 (b-clar), Garth Knox7 (viola d’amore), Decibel1,3,6, Fidelio Trio2, ConTempo Quartet5. NMC Records NMC D169 (1 CD) (http://www.nmcrec.co.uk/). Bennett delights in surface-removing abrasives. The thumping Stop-Motion Music could possibly derail a train. (It was written for Dublin’s Crash Ensemble.) While there’s little wrong with a hard-driving style, a few pedal drums and amplification, Bennett wields them within a narrow palette. The more interesting works are the solos and Slow Down for piano trio which could give a sphygmomanometer fits. Monster posits a bass clarinet against a cajoling tape. The most interesting work is Ghosts for an amplified Knox on viola d’amore – a flamenco ghost, presumably. 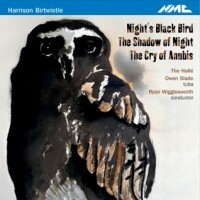 Harrison BIRTWISTLE: Night’s Black Bird (2004); The Shadow of Night (2001); The Cry of Anubis (1994)*. Owen Slade* (tuba), The Hallé, Ryan Wigglesworth (cond.). NMC Records NMC D156 (1 CD) (http://www.nmcrec.co.uk/). The disc’s theme encircles nature, darkness and death. Night’s Black Bird is a Mahlerian gloam. Programmed second, The Shadow of Night would appear to be a continuation of Night’s Black Bird, at 28:15, twice the length of the preceding 14:04. However, the larger work progresses at a dramatically slower, even suffocating pace. The rather old fashioned, perky and simpler Night’s Black Bird’s recent date surprises. The Cry of Anubis ought to take a principal place among the scant handful of tuba concertos. Because Anubis was a character in Birtwistle’s The Second Mrs. Kong, a narrative could obtain. If there is one it’s obscure. The soloist paws at the ground and growls underneath rich accompaniment. A Tuba mirum connotation seems apt. 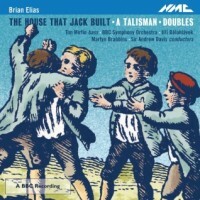 Brian ELIAS: The House that Jack Built (2001)1; A Talisman (2004)2; Doubles (2009)3. Tim Mirfin2 (bass), BBC Symphony Orchestra1,2,3, Andrew Davis1, Martyn Brabbins2, Jiří Bĕlohlávek3 (conds.). NMC Records NMC D173 (1 CD) (http://www.nmcrec.co.uk/). Energetic and fitful, Elias’ music quickly achieves its boiling point. The House that Jack Built proceeds like a perpetual nursery rhyme with new lines reacting to the preceding, and motion occurring as ideas accrue. An immediately comprehensible line navigates Elias’ orchestra. Schoenberg’s Variations come to mind. Indeed because the six-part Doubles explicitly considers reuse and repetition, and A Talisman sets the Hebrew inscription on a family amulet, the comparison with Schoenberg works well. 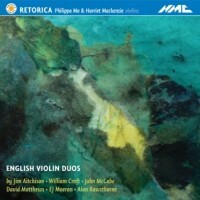 “English Violin Duos.” Jim AITCHISON: Syruw: Five Kazakh Tableaux (2009). John McCABE: Spielend (2003). Ernest John MOERAN: Sonata (1930). William CROFT: Sonata IV, Op. 3, No. 4 (1704). David MATTHEWS: Eight Duos, Op. 79 (1999–2001). Alan RAWSTHORNE: Theme and Variations (1937). Rhetorica: Philippa Mo, Harriet Mackenzie (vlns). NMC Records NMC D182 (1 CD) (http://www.nmcrec.co.uk/). I found the title’s “English” prefix momentarily offputting. Anything but. This smart pair delivers a well-constructed and varied program. Master Croft’s duo is the oldest, yet it’s not played like a starchy Baroque curio. Similarly, it’s hard to believe the Moeran and Rawsthorne date from the 1930s, apart from the latter’s variations suggesting textbook-derived Bartók examples. Matthews’ Duos, commissioned for violinist Mo, seems the most traditionally modern. Aitchison transforms the Kazakh materials respectfully. There’s much to admire in the work’s modes, long pedals, whispering effects and boisterous fiddling. McCabe’s Spielend reflects both applied sportsmanship and casual recreation. “Transmission.” Richard BARRETT: interference (1996-2000); abglanzbeladen/auseinandergeschrieben (1992-96); basalt (1990-91); air (1993); knospend-gespaltener (1992-93); transmission (1996-99). Elision. NMC Records NMC D117 (1 CD) (http://www.nmcrec.co.uk/). “Negatives.” Richard BARRETT: ne songe plus à fuir (1985-86); EARTH (1987-88); another heavenly day (1989-90); negatives (1988-93); codex I (2001). Elision. NMC Records NMC D143 (1 CD) (http://www.nmcrec.co.uk/). 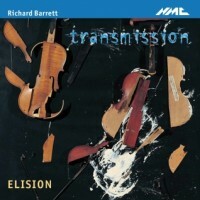 Six solos (one abetted by electronics) appear on Transmission. At some point one tires of frenzied modernism, of a bass clarinetist who speaks and thumps a pedal bass drum (interference), an incessantly warbling trombone (basalt) and a caustic violin (air). The title piece, an 18-minute romp for electric guitar pushing through aggressive tape and electronics, may sustain interest. These solos fit into larger works: transmission and interference are in DARK MATTER, Opening of the Mouth which sets Celan contains abglanzbeladen/auseinandergeschrieben, air and knospend-gespaltener. Negatives, which absorbs basalt by adding strings and percussion, opens with an episodic cello solo, ne songe plus à fuir, the scrapes and aggressive gestures of which will rattle the china. Barrett’s first solo work sets out decades of preoccupations. Varèsian percussion joins with trombone for the shamanistic EARTH, suggesting that interference has similar intentions. It’s evident that Barrett likes his players to pursue chaotically compassionless independent lines. 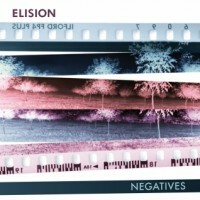 negatives’ frisky 10-string guitar, flute and mandolin recall Boulez’s Le Marteau. When basalt reappears as basalt-E, the twittering strings provide welcome background chatter. To judge from but one example, it’s not clear that the ensembles stand taller than the absorbed solos. Both solos and ensembles project snarky ambivalence, with the works with electronics and / or electric guitar, another heavenly day (adding e-flat clarinet and contrabass) and transmission, providing greater interest. 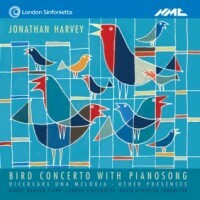 Jonathan HARVEY: Bird Concerto with Pianosong (2001)1; two versions of Ricercare una melodia (1984)2,3; Other Presences (2006)4. Hidéki Nagano1 (pno), Gareth Hulse2 (ob), Paul Archibald4 (trpt), Tim Gill3 (cello), Sound Intermedia2,3,4 (electronics), London Sinfonietta1, David Atherton1 (cond.). NMC Records NMC D177 (1 CD) (http://www.nmcrec.co.uk/). None of Harvey’s five orchestral items on NMC D141 engaged my interest. For contrast, NMC D177 makes a lasting impression, starting with the quizzically named Bird Concerto with Pianosong. While Messiaen fans will find a lot to like, Harvey proceeds via sampler further than piano bird imitations. Live electronics create spatial diffusion as well as ring modulation, with soloist, instruments and birds blending and whirring. Ricercare una melodia, marrying soloist with electronics and delays, can be tackled by a variety of instruments. A testament to the six-minute piece’s versatility and Harvey’s electronic savvy, oboe and cello each make the work distinctively their own. Written for Markus Stockhausen, Other Presences pairs trumpet with delays, harmonizers and loops. Perhaps it’s because we’re treated to two versions of Ricercare that those performances interest more.